Author Written by Velmurugan Saravanavelu and last updated on Posted on July 17, 2017 . 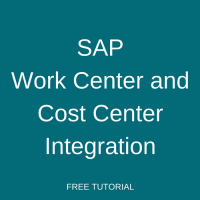 Welcome to the tutorial about SAP Work Center and Cost Center Integration. This tutorial is part of the SAP PP training course. You will learn about the relationship between work centers and cost centers in SAP, how to use activity types and define activity prices. Also, we will discuss a complete example of calculating activity cost in product costing. What is a Cost center in SAP? 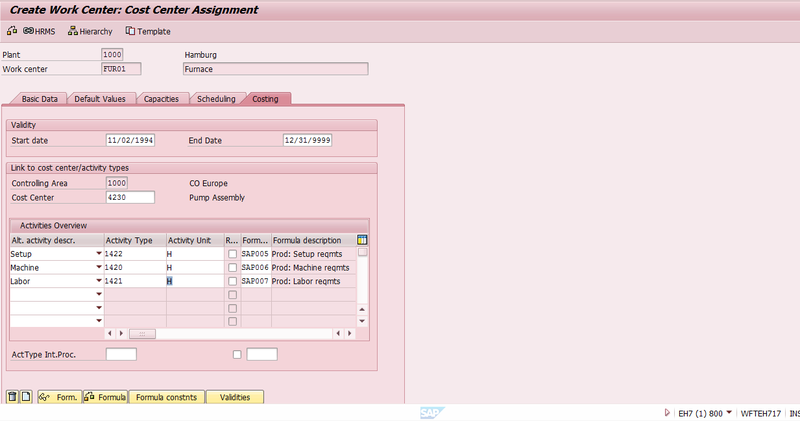 In SAP production planning, each work center will be assigned to one cost center. For every activity type defined in a work center, an activity rate will be maintained in the cost center. 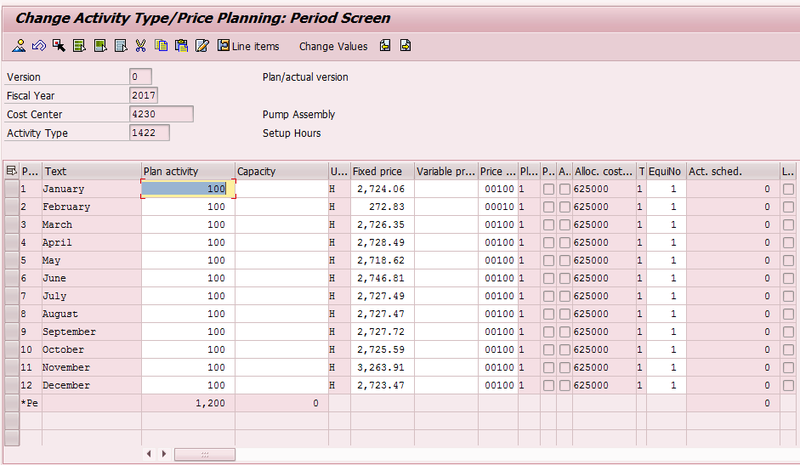 SAP system uses this information to calculate activity cost for an operation. We can assign a work center to only one cost center. But we can assign several work centers to one cost center. In this case, we can define two activity types in the work center EAF01 (electric arc furnace) and assign them to work center EAF01. The work center is assigned to the cost center F1000. Activity rate for each activity (furnace hours and labor hours) are maintained against the cost center. Planned furnace hours and labor hours are maintained for the base quantity of 120 T (furnace capacity) in a routing. Formula for each activity (furnace hours and labor hours) are maintained in a work center. 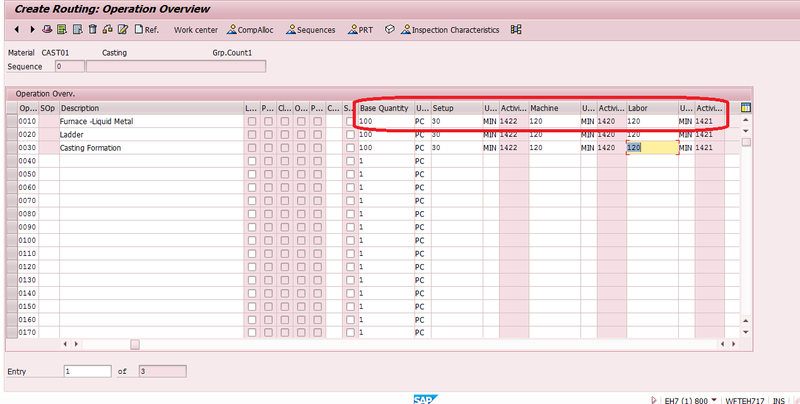 When a production order is created in the SAP system, it uses the above information to calculate the activity cost. Activities produced in a cost center are created as activity types. In the above example, two activities are produced in a furnace which are machine hours and labor hours. 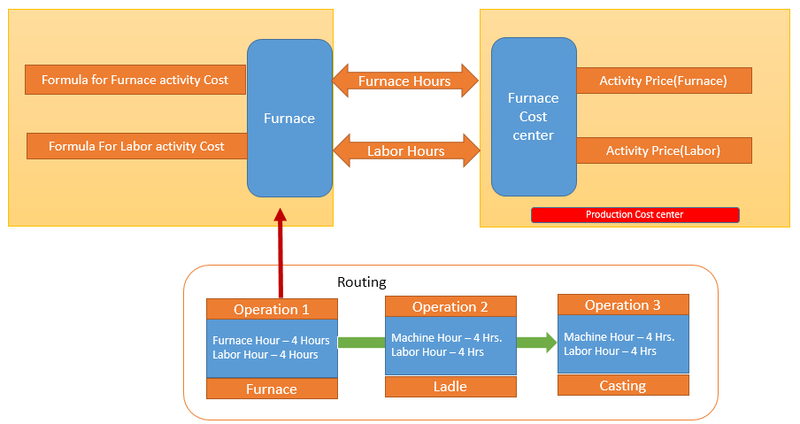 We can create these two activity types and assign them to the cost center of furnace. 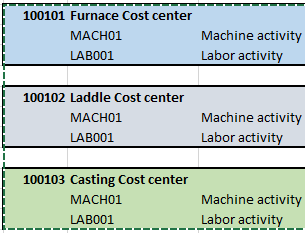 The same two activity types can also be assigned to cost centers of ladle and casting. Activity price will be defined for each activity type and cost center manually. In this example, even though we have similar activity types for all three cost centers, activity price will be different for each cost center. The activity price is defined in the transaction KP26. Here, activity cost is calculated based on work centers, cost centers and activity prices. 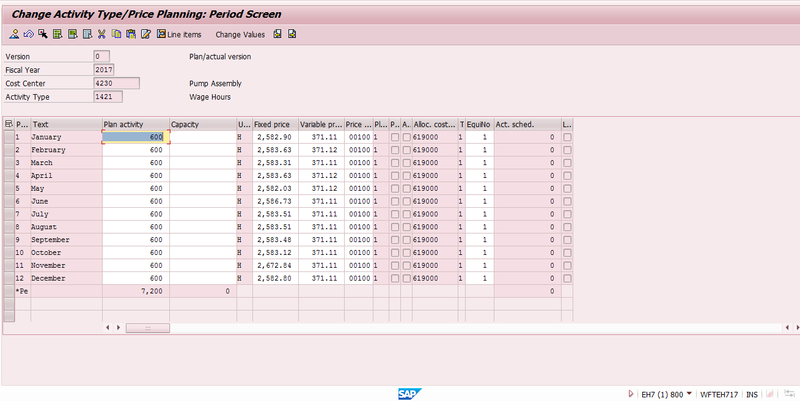 The SAP system calculates the activity cost by multiplying the activity price to quantity of operations. The work center is assigned to the cost center (4230) and each activity (setup, machine and labor) is assigned with an activity type (1422, 1420 and 1421). Now, let’s look at activity price calculation. Activity prices are maintained for the cost center (4230) and activity types (1422, 1420 and 1421) in the transaction KP26 by a controlling person. Next, let’s check routing details of the material. It will specify how many units of each activity are required for manufacturing a base quantity of this material. We perform a costing run for the material CAST01 in transaction CK11N to see how the SAP system calculates product cost for this material. On the picture above, the highlighted area is the activity cost calculated by the system based on the information maintained in the work center (transaction CR01), activity price (transaction KP26) and routing (transaction CA01). For other activity types calculation is performed in a similar manner. Nice,able to understand . Can your team guide in preparing for certification. Hi, where is the “10” in quantity coming from? and how do you calculate the 2246.88 in Activity Price? I am not receiving SAP PP training emails for i kindly request you to send me the mails. I have completed training till 1.5 – SAP Work Center and Cost Center Integration. Hope you will send me the rest and will help me in completing the course. Sir,able to understand and easy to follow. I’m not receiving the lessons from PP training anymore! I’ve completed the training till 1.5 lesson after that no more lessons received.